The Australian-Pacific transform plate boundary fault zone along the Macquarie and McDougall segments of the Macquarie Ridge Complex (MRC), south of New Zealand, is characterized by dominantly normal faults and pull-apart basins, in apparent conflict with the regional transpressional tectonic setting. We propose that present-day curvature of the transform is inherited from a preexisting divergent plate boundary and that the overall extensional kinematics shown by faults along the main plate boundary trace and exposed on Macquarie Island result from local stresses related to right-lateral, right stepping, en echelon plate boundary faults and not to the current transpressional setting. Transpression along the Australian-Pacific transform plate boundary has resulted in uplift along the 1500 km long Macquarie Ridge Complex. Macquarie Island, the only subaerial exposure of the complex, sits atop a 5 km high, 50 km wide submarine ridge of oceanic crust and lies 4.5 km east of the major active plate boundary fault zone. Thus Macquarie Island and the surrounding seafloor provide a unique opportunity to study an active oceanic transform fault using complementary marine geophysical and land-based geological data. Mapping of recent faults affecting the topography of Macquarie Island shows that the island is extensively cut by high-angle normal faults forming pull-apart basins. Furthermore, evidence for reverse motion is rare. Using marine geophysical data, including swath bathymetry, reflectivity, and seismic reflection data, collected along the Australian-Pacific plate boundary north and south of the island, we have defined a 5–15 km wide plate boundary zone. A series of right stepping en echelon faults, within this zone, lies along the main plate boundary trace. At the right stepping fault terminations, elongate depressions (10 km wide and 1.2 km deep) parallel the plate boundary, which we interpret as extensional relay zones or pullapart basins. 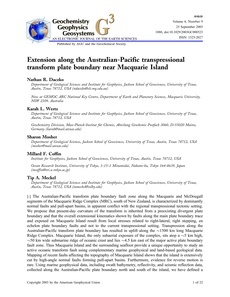 We propose that transpression is partitioned into en echelon strike-slip faults at the plate boundary and a convergent component that flexes the crust, causing the anomalous bathymetric ridge and trough morphology of the McDougall and Macquarie segments of the MRC. Australia-Pacific plate boundary; transform; transpression; strike-slip fault; en echelon; Macquarie.